Lights' silhouette sings the first song on the set, "New Fears." The Lights concert at Delmar Hall in St. Louis was more than a de-light-ful event for those who went. It was a show packed with dancing, clothing changes, singing, crying, laughing at a pizza box/synth transition and nods to Lights’ “Skin&Earth” comic series crossover with her recent album release named “Skin&Earth” as well. As a diehard Lights fan, this was my sixth concert, and it blew me away. The amount of detail and passion put into her We Were Here Tour was astounding. 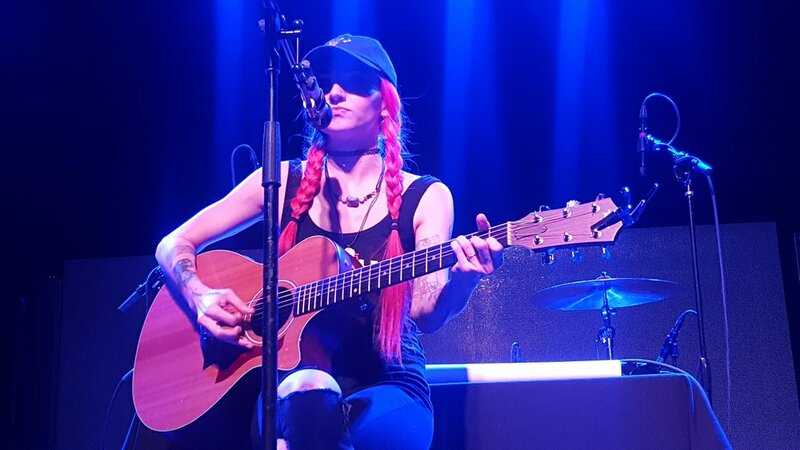 She played a mix of old songs from her older albums, including an acoustic chill with wine, then loud guitar riffs, allowing concert attendees to feel a range of emotions during the set. This might sound unappealing, but Lights pulled it off flawlessly, taking advantage of her long discography and using transitions from her comics with an LED screen in the back of the stage. In the past, Lights’ tours involved her surrounded by synth keyboards she utilized throughout the set, but this time the audience saw a single microphone stand and her band members’ instruments. However, this was a nice change. No longer hidden by numerous synths, the crowd had an amazing view of Lights taking the stage and owning it. Although Lights claims she is a bad dancer, no one took notice — everyone danced right along with her. Her bright red hair radiated on the stage as she whipped and flipped it around with confidence for an hour and a half set. The setlist was amazing with Lights keeping the audience on their “Toes,” featuring them every so often to make sure they were all still with her. Delmar Hall was rocking every step of the way with her, never skipping a beat. Acoustic is a staple of Lights, allowing an intimate atmosphere and connection with the audience and singer. However, there were a few songs where she sat with a guitar and brought the band closer to her in the middle of the stage. She played acoustic songs, which are always a staple with Lights. Stripping down all the instruments allows her to shine in a different perspective, a calming place still packed with energy and passion. These songs were “Banner,” a Cher cover of Cher’s “Believe” and “Muscle Memory.” During “Muscle Memory,” she lost the guitar and instead drank a cup of wine and swayed to the chill atmosphere it gave. Lights playing her custom-made "Skin&Earth" electric guitar. Under her right arm you can see the important symbol for the album and comic. As always, she came back with a two-song encore, “We Were Here,” the title of the tour, and “Almost Had Me,” which happens to be the last song on “Skin&Earth” and last chapter in the comics. She played the last song with a keyboard covered in candles and really brought it home. This woman never fails to astound and surprise her fans, empowering them and reminding them constantly how hardworking and appreciative she is when it comes to all her projects, in the past and upcoming. Lights proved “We Were Here” during the show, and those who saw her can’t wait until the next visit. Who knows what she’ll bring next? Check her website here for more info iamlights.com and her Facebook here https://www.facebook.com/lights/. Also, she is very active on Twitter https://twitter.com/lights. Before the concert, VIP got an intimate acoustic set, complete with a QnA, meet and greet with Lights and a photo.